Echoes of Norway: My birthday gift to the Mr.
My birthday gift to the Mr. If you are interested in getting a loved one something VERY special like this caricature, let me know and I would gladly get you in touch with him. He charges a $100 USD for a A3 caricature. He is also great at portrait drawing and drew a portrait of Bill Clinton when he was here in Tromsø about two years ago that he got to take back home. 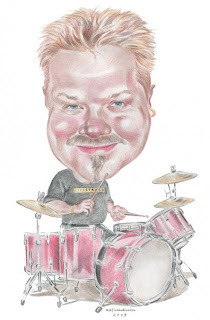 Here is the drawing of John which is copyrighted by the artist Rolf Klaudiussen! Please do not copy unless you have gotten permission to do so! Thank you! Can you love a stone?